My Occasional Blog: Sign of the Times? Singapore was brief layover between Bali and Bangkok. Unlike either Bali or Bangkok, Singapore is a very orderly place. I get the sense that Singapore is a better place to live than to visit. It’s a little too orderly for me. There’s a popular urban legend that even chewing gum is illegal here, which is not true. You are not allowed to spit it out though. In fact, you’re not allowed to spit in general. Nor are you allowed to urinate on the sidewalk. This sign, complete with bright yellow background (don’t know what the subliminal message is there), was in Little India. 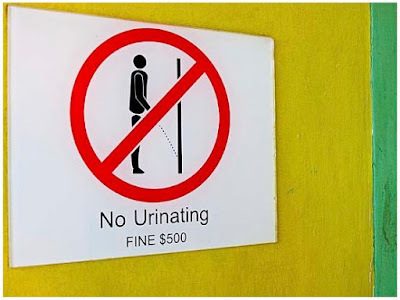 The $500 fine is not as bad as it sounds. That’s $500 Singapore, it’s only about $364 US. There are more photos from Singapore in my PhotoShelter archive or available from ZUMA Press.